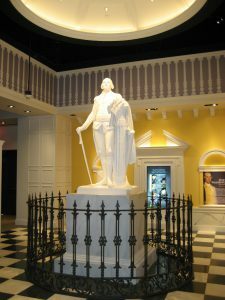 The American Revolution Museum at Yorktown, which replaces the Yorktown Victory Center, is among America’s foremost sites that tell the story of the nation’s founding. Through comprehensive indoor exhibits and outdoor living history, the new museum offers a truly national perspective, conveying a sense of the transformational nature and epic scale of the Revolution and the richness and complexity of the country’s Revolutionary heritage. A new 80,000-square-foot building opened in March 2015. 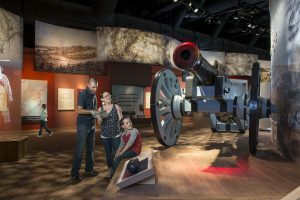 The introductory film and 22,000-square-foot exhibition galleries – and the “American Revolution Museum at Yorktown” name – debuted with a preview of the new museum October 15 and 16, 2016, during the annual Yorktown Victory Celebration event marking the anniversary of America’s momentous 1781 Revolutionary War victory at Yorktown. 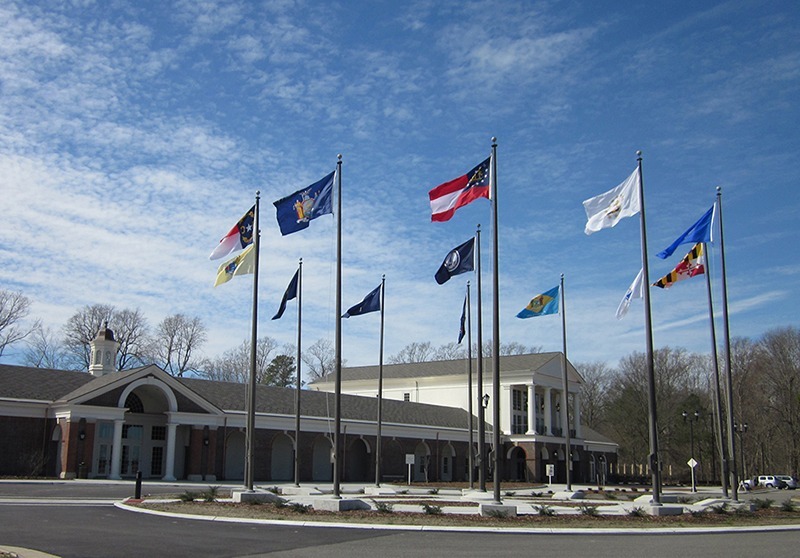 A Grand Opening Celebration, from March 23 to April 4, 2017, officially launched the American Revolution Museum at Yorktown with a salute to the first 13 states in the order that they ratified the U.S. Constitution. The museum was dedicated on April 1, 2017. In the museum theater, “Liberty Fever” draws visitors into the world of Revolutionary America, setting the stage for indoor gallery and outdoor living-history experiences. The introductory film is narrated by an early 19th-century storyteller who has traveled the country gathering stories about the American Revolution and shares his accounts using a moving panorama presentation of the time period. The permanent exhibition galleries engage visitors in the tumult, drama and promise of the Revolution through period artifacts and immersive environments, dioramas, interactive exhibits and short films. Among close to 500 artifacts on exhibit is a Declaration of Independence broadside dating to July 1776; a June 1776 Philadelphia printing of the Virginia Declaration of Rights, one of the inspirations for the U.S. Declaration of Independence; a coronation portrait of King George III from the studio of Allan Ramsay; one of the two earliest known portraits done from life of an African who had been enslaved in the 13 original colonies; and an extremely rare early southern American long rifle. The galleries presents five major themes. The British Empire and America examines the geography, demography, culture and economy of America prior to the Revolution and the political relationship with Britain. The Changing Relationship – Britain and North America chronicles the growing rift between the American colonies and Britain. Within a full-scale wharf setting, issues of taxation and importation are brought into focus. Revolution traces the war from the battles of Lexington and Concord in 1775 to victory at Yorktown in 1781 and the aftermath. An experiential theater will transport visitors to the Yorktown battlefield with wind, smoke and the thunder of cannon fire. The wartime homefront is portrayed in three-dimensional settings that provide a backdrop for the stories of diverse Americans – Patriots and Loyalists, women, and enslaved and free African Americans. The New Nation outlines the challenges faced by the United States in the 1780s – weak government under the Articles of Confederation, the unstable postwar economy and new social tensions – culminating with the creation of the Constitution as a framework for the future. The American People explores the emergence of a new national identity following the Revolution – influenced by immigration, internal migration, and demographic, political and social changes. This section shows how the nation’s struggle for independence impacted not just America, but the world. The living-history Continental Army encampment and Revolution-era farm continue as an integral part of the museum experience. An informational pavilion assists visitors with the transition from indoor galleries to the outdoor areas, where they engage in array of hands-on activities, from military drills to watering and weeding crops. The encampment and farm support the new gallery storylines and expand capacity for visitor-participatory demonstrations. The encampment, which represents a portion of an American regiment with tents for soldiers and officers as well as surgeon’s and quartermaster’s quarters, includes a drill field and an artillery demonstration area with tiered seating that from the outside looks like a redoubt. Situated just beyond the encampment, the farm has a larger house, kitchen and tobacco barn and a new building representing quarters for enslaved people, along with spaces for crop fields, kitchen garden and orchard. A specific 18th-century York County family serves as a frame of reference for historical interpretation. 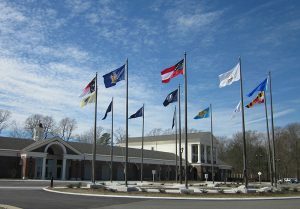 Located within the Jamestown-Williamsburg-Yorktown “Historic Triangle” and next to Yorktown National Battlefield, the American Revolution Museum at Yorktown opened in 1976 as one of three Virginia visitor centers for the Bicentennial of the American Revolution. The Jamestown-Yorktown Foundation, the state agency that also operates Jamestown Settlement, implemented structural and exhibit improvements in the 1990s, broadening the museum’s focus to encompass the entire Revolution. The American Revolution Museum at Yorktown is the realization of a master plan adopted in 2007. The plan called for replacing the 1976 facility, with the new building positioned on the 22-acre site to allow for continued operation throughout construction, and repositioning and reconstructing the encampment and farm. An important feature of the new building is an education center, with five classrooms and a separate entrance, to serve student groups and the general public with dynamic, interactive learning experiences. Planning, building and exhibit construction, and renovations to the site, including living-history areas, are funded by the Commonwealth of Virginia. Major components of the project total approximately $50 million. Private donations to the American Revolution Museum at Yorktown Campaign for Support are funding elements of gallery and outdoor exhibits, including artifact acquisitions, and educational resources.